First and foremost, I would like to thank all of the players and students for an incredible job. The behavior, enthusiasm and school spirit was recognized by our Assistant Principals and greatly appreciated!!! As for the tournament, it was well played and very competitive but in the end it was all about Ball or Nothing as five of their seven team members, Andrew Ris, Matt Robison, Joe Valli, Dylan DeMeo and MVP Erick Vilchez, claimed their second title in as many years. Joining in on the fun this year for them was James Harrison and Ryan Mehr. Congrats again! The opening game saw the tuxedo clad B-Squad and Friends win the fans' hearts but not much else as they were dropped by I'll See You at the Greene Turtle, who if they are there can say hello to Ball or Nothing who will be enjoying a free meal :), in straight sets. Marino's Italian Ices followed that sweep with their own over Bearforce1 who were easily the Belles of the Ball as they danced their way into Carey Dodgeball immortality. Game three saw our first upset as InstaFamous behind the triple play skills of Vinny Fortunato sent Jieran's Disciples back to the tennis courts to practice for next year. The final West Bracket game included a dazzling Red Cape huddle by the Superfreaks and an ingenious Roid Rage lineup with Baseball names to boot...very clever!!!!!!!! The 'freaks advanced in three. The East Bracket opened with a near Full Monty as the Caucasian Invasion stripped out of their nerd outfits and performed their own dazzling entrance. Unfortunately, The Sweets weren't interested in their outfits as they pulled off the upset of the tournament as the Caucasians were shown the door. The brilliantly dressed Dodgefathers were also given an unceremonious boot as Ron Burgundy's Channel 4 news Crew was the only show in this matchup. Let's Get Surgical stayed home to watch Training Day but still advanced over Casper the Friendly Ghost's Team. Wrapping up the final game of the Sweet 16 was Monstars and Ball or Nothing which was the game of the day as Monstars stole the first one only to see Ball or Nothing return with a vengeance in games two and three to escape the round. The Quarterfinals opened with a Marino's rout of the Greene Turtles. That was followed by a Superfreaks, led by Jimmy T-Shirts, victory over InstaFamous to set up that matchup. In the other bracket Ron Burgundy's knocked off the valiant Sweets as the clock struck midnight for the Cinderella Candy Crew. Sensing relief at escaping Monstars, Ball or Nothing trounced Let's Get Surgical who patiently waited nearly three hours to play. Moving to the Semi-Finals Superfreaks kept their Rick James attitude jumping as they sent the Icemen packing. The other Semi pitted Ron Burgundy and Ball or Nothing as these highly ranked teams did not disappoint as the right to move to the Finals was eventually won out by the resilient Ball or Nothing squad. So here it was Superfreaks as a mild 10 to 1 underdog trying to de-throne the Ball or Nothing 2 to 1ers. 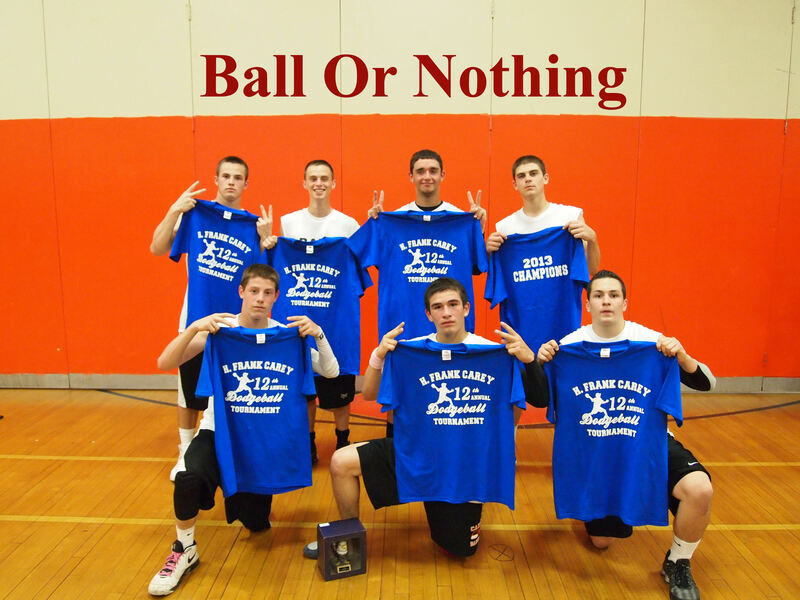 By this time the Ball or Nothing had it at full throttle as they wrapped up the title in four games to scoop up a free dinner and some free T-Shirts. On behalf of the Baseball Club, Thanks to All who participated and have a great Summer!! Other Thoughts-Special Thanks to Dan Fey for taking all the pictures and Gianfranco for DJ'ing. Also to Mrs. Angelillo, Mr. McLees, Ms. Flynn and Mr. Kenny for granting permission for the Tournament. Also a tremendous thanks to Head Custodian Steve Vitale and the rest of the custodial staff. Best Moment of the Tournament-The 12th Consecutive Year Carey Students Showed How Awesome They Can Be By Behaving Perfectly!!!!!!!! Thanks from Mr. Hedquist. Now let's get down to business. Under no circumstances can the following things happen: 1) No Inappropriate Team Names-If you are not sure then ask Mr. Farina or myself. 2) Do NOT wear your Dodgeball Gameday Uniform during the school day--All Headbands, Hats, Bandanas, Etc. will be confiscated and you will become a distraction to the educational process. Worse off you will put this tournament in jeopardy of becoming extinct! 3) When you attend the Tournament-Do NOT hang around or walk through the hallways-No getting books, or "I forgot something in my locker" nonsense. When the entire crowd leaves after the tournament you should exit the building and head home. 4) No foul language or inappropriate behavior will be tolerated on the court or in the stands. 5) Make sure you are attending all of your Review classes and extra study periods-budget your time properly. If there is a conflict with the tournament make arrangements so you go to the review courses in the morning. Marino's Ices ____Ball or Nothing Ron B. * These Odds have been put in to drum up friendly banter between Dodgeball Contestants. They do NOT represent gambling in any shape or form. All of Their Players 6'4" and Taller Finally Dunk!!!! JB Finally Stops Cutting Class!!!!! Kess Grows His Hair Long Again! Mess Wes Plays on the Pro Bowlers Tour! John H. Learns What The Steal Sign Is!! Willy Wonka Invents a Candy Bar to Help These Guys Play Better! They Leave the Library and Find a Weight Room! The Actual Bear Force One Guys Come to Carey.